Blueboard Review 2019: Is Blueboard a Good Hosting? Blueboard is a multi-hosting, servers, and domain names service provider based in the Czech Republic. It’s in the list of the top 20 largest hosting companies in the Czech Republic. 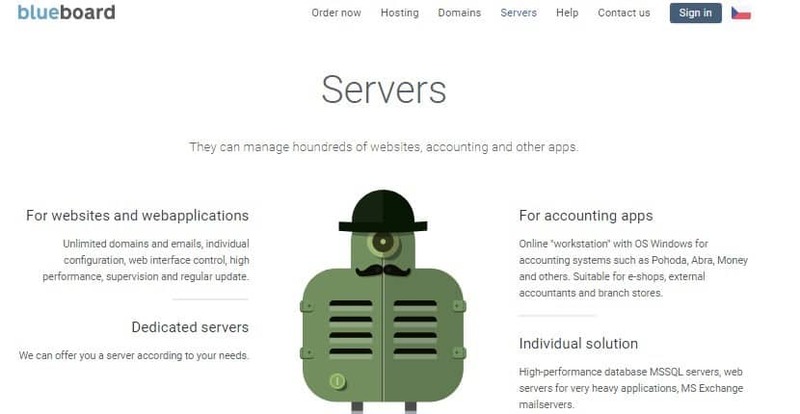 Blueboard is a Czech Republic-based hosting company that offers multi-hosting solutions to small and medium-sized businesses. The hosting vendor also has a significant presence in Bulgaria, Brazil, Slovakia, and Vietnam. They appear in the list of the top 20 largest hosting companies in the Czech Republic. The Blueboard website is available in two languages: Czech and English. Blueboard web servers are highly secured and have generous space limits. Their dedicated and virtual mini servers come with a user-friendly control panel for server administrators. This hosting provider performs free daily backups for their clients websites and databases, and you can download the backups anytime you want by signing into their special FTP account. However, the backups available are only for the previous 14 days and they exclude backups of certain types of files such as archives and multimedia files. The Blueboard email hosting plan comes with a mailbox size of up to 8GB. However, one mailbox is limited to 500 emails a day. The Blueboard website is poorly designed and tedious to navigate. Furthermore, the website has sketchy information regarding the hosting company’s hosting services, especially virtual and dedicated web hosting solutions, where there’s almost zero information about them. Blueboard shared hosting plans are cheap and pretty good for small websites, especially considering the long list of features included. Their hosting plans’ prices are listed in Czech Koruna. Blueboard’s VPS and dedicated servers hosting plans are quite expensive and given that there is very little information about them on the vendor’s website, it’s hard to know just how justified these prices are or what features that users can expect to find. Blueboard hosting plans are billed monthly, but if you order for more than one year, they offer up to a 20% discount. It’s important to note that Blueboard doesn’t have any refund policies or network uptime guarantee. Blueboard has an online chat box and a ticketing system available to all who visit their website. Alternatively, you can reach out to them via their telephone number and email. The support team is very responsive and they try their best to be helpful when addressing the issues raised by their clients. The Blueboard website has a fairly detailed knowledge base with very helpful tutorials, as well. Blueboard web hosting services are clearly not designed to meet the hosting needs of large companies or fast-growing enterprises. Their solutions are best suited for Czech Republic-based businesses and individuals running personal blogs or small websites. Check out Blueboard’s web hosting options today! Wondering how Blueboard stacks up against other Web Hosting companies? Enter any other Web Hosting company and we will give you a side-by-side comparison.